This dress manages to effortlessly combine two of our favorite trends this season—the high low hemline and ombre color scheme. The Grey and White Ombre High Low Dress is fully lined to the mid-thigh. 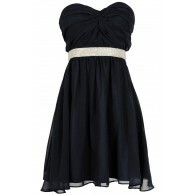 It has a strapless sweetheart neckline, lined and lightly padded bust, and an empire waist. 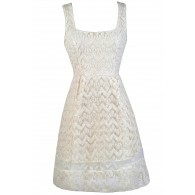 The bust of this dress is made of ivory lace while the attached skirt is made of chiffon. The skirt has a high low cut and grey and white ombre detail. An exposed back zipper completes this fun, trendy dress. The Grey and White Ombre High Low Dress would look great paired with white or grey wedges or heels. This is a fun look with a retro vibe. Details: Fully lined to mid-thigh. Lined and lightly padded bust. Exposed back zipper. 100% polyester. Self 2: 90% nylon, 10% spandex. Lining: 100% polyester. Dry clean or hand wash cold. Do not bleach. Hang or flat dry. Small measurements: Length from top of bust to hemline: 28-38”. Bust: 30”. You have added Grey and White Ombre High Low Dress into Wishlist. 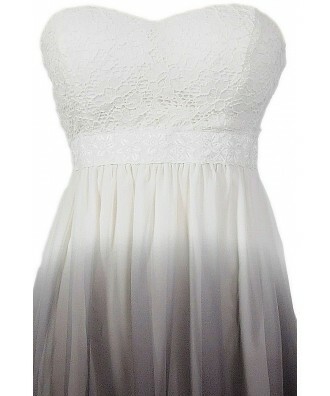 You have added Grey and White Ombre High Low Dress for Stock Notification. You have set Grey and White Ombre High Low Dress as a loved product. You have removed Grey and White Ombre High Low Dress as a loved product.